On 9/2/08, I reported on the rather incomplete information released by New York City in response to my Freedom of Information Law (FOIL) request seeking information about the city's willingness to devote an additional $105 million to Atlantic Yards, on top of the original $100 million pledge. The city stated that the additional $105 million "represents capital projects to support infrastructure and other capital needs in the area, some of which are independent of, but in the area of the planned Atlantic Yards project." As I wrote, most of those capital projects did not seem independent of Atlantic Yards. Among them was $7 million for reconstruction of the Sixth Avenue Bridge. 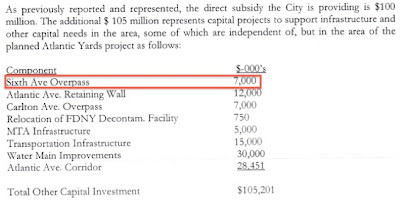 However, given changes in the plan for the arena block, the bridge will not need reconstruction, as noted on page 4 of the June 2009 Technical Memorandum produced by the Empire State Development Corporation (ESDC). So, what happens to that $7 million? Is it simply redeployed or funneled to developer Forest City Ratner? I asked the ESDC, which told me to query the New York City Economic Development Corporation, which I did late on Tuesday, with no response as of yet. Now $7 million may seem rather small in the context of a $4.9 billion project. But it surely would mean a lot to Forest City Ratner. And it could also help a lot for parks, or playgrounds, or libraries, or public transit.